We all love this sweet treat, but be warned – these aren’t your average donuts! When craft and baking prowess combine, you’re left with these novelty donuts which actually look like edible works of art. Today we’ve rounded-up 30 of these amazing DIY novelty donut tutorials so that you too can get creative with your sweet treats. From donuts that look like burgers and pineapples, to ones which resemble flamingos, rainbows, your favorite Disney characters, and everything else in between – you’ll certainly be spoiled for choice here! It’s time to embrace your love for this ‘holey’ dessert and see what quirky creations you can whip-up this weekend! Have you ever tried a toffee apple donut before? If you haven’t, here’s your chance, as Aww Sam will teach you how to recreate these for yourself! If there’s ever a phrase that donut lovers want to hear, it’s this – “donuts on donuts on donuts”! Aww Sam will show you how to get this ‘stacks-on’ donuts effect. Flamingo and swan pool floats are all the rage now, so imagine our excitement when the talented Aww Sam decided to create these in donut version! These will be the true show-stoppers of any pool party. It just wouldn’t be a novelty donut round-up without some sort of Emoji donut, would it? Thankfully, Aww Sam has combined her love of donuts with the sparkling heart Emoji for a treat that almost looks too good to eat! How quirky are these DIY conversation heart donuts from Aww Sam? They’re like a Technicolor Valentine’s Day dream! When you combine the much-loved hamburger with the equally-as-loved donut, you get this genius DIY creation from Aww Sam! Be sure to check out her step-by-step guide to recreate your own. Show your BFF’s how much you love them by serving up these DIY ‘best friend’ heart donuts from Bespoke Bride at your next soiree! You can also mix and match the icing colors for a fun new look. Somewhere over the rainbow you’ll find these incredible DIY donuts created by Aww Sam for Brit + Co! Does it get any cooler than this? Here’s a unique Halloween treat idea for when October rolls around! Chez Cateylou has created these DIY candy corn donuts for a sweet alternative to traditionally scary snacks. Here’s a genius way to create tie-dye inspired rainbow donuts! Eugenie Kitchen has a fantastic tutorial to show you how. When it comes to making a novelty donut, sometimes it’s best to just put a ring on it! These DIY donuts are perfect for engagement parties or hens nights, so be sure to check out the full tutorial via Evite. These DIY Pusheen donuts from Fork to Belly will probably take out the award for ‘world’s cutest donut’! We were so surprised by how easy these are to create, and we think you will be too! 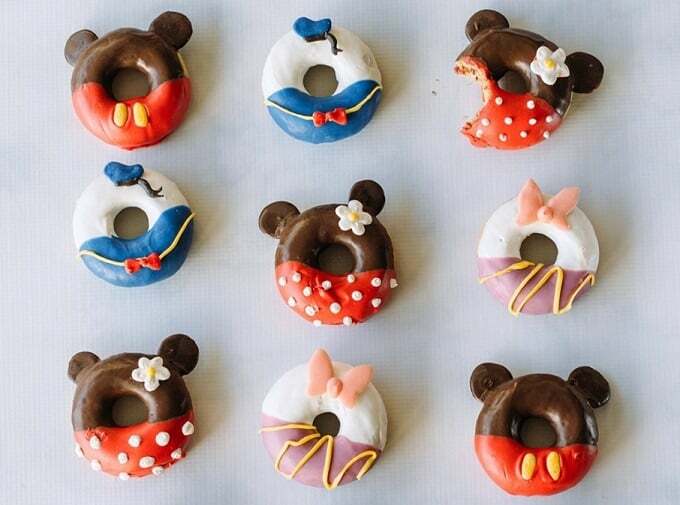 Celebrate all things Disney with these DIY donuts from Fork to Belly! Which characters will you recreate? We’d love to see your results! These beautiful edible flower donuts from I Spy DIY are sure to jazz-up any dessert table! We think they’re perfect for a whole range of events, from birthdays and bridal tea parties to baby showers and beyond. Here’s a spooky but delicious Halloween treat that everyone are sure to love! It’s Always Autumn will show you how to recreate a DIY donut spider just like this one. Who doesn’t love a cute and chocolatey bear? These DIY bear donuts from My Mommy Style are not only fun to make, but delicious to eat too! We can’t think of a cooler treat to celebrate summer than these DIY pineapple donuts from One Broads Journey. Be warned though – these are so delicious that they’ll be gone in seconds. These DIY powdered ombre donuts look heavenly, don’t they? Paper & Stitch is the talented blogger behind this step-by-step tutorial! If there’s one thing that can make donuts instantly even better (if that’s possible), it’s macaron sprinkles! Paper & Stitch has created this colorful version that’s perfect to serve-up at any party. These watermelon glazed donuts from Paper & Stitch blog look amazing, don’t they? They’re the ultimate summer inspired treat! What could be cuter than these DIY kitty cat donuts from Schoen Und Fein? These little treats are almost too adorable to eat! Here’s another elegant DIY flamingo donut that will knock your guests’ socks off! Shoes Off Please has certainly excelled herself with this brilliant tutorial. Here’s a fast and fabulous way to transform ordinary donuts into Halloween works of art! Six Sisters Stuff are the queens of cool recipes. Wow, we can hardly believe our eyes! Studio DIY has created these quirky and colorful funfetti cream cheese + rainbow bagel donuts. These DIY melted ice cream cone donuts from Studio DIY are a cheeky and clever take on two of our most favorite desserts! We think these would look great at any birthday celebration. Here’s another mash-up of two favorite sweet treats that we think you’ll adore! Studio DIY has shared her tutorial for creating fairy floss donuts that are sure to delight. Don’t let your donuts burn in the sun! Thankfully, Studio DIY is super sun-smart so has created these DIY umbrella donuts. Yum yum! You’ve probably seen these California donuts all over social media, but forget traveling to California to get your fix – Tanamontana100 has created a YouTube video tutorial to help you out! Here’s a Christmas inspired treat that you can enjoy all-year-round! These DIY reindeer donuts from The Melrose Family are the perfect combination of salty and sweet. These DIY edible pressed flower donuts are an absolute work of art! The Merry Thought is here to show you how you too can make these stunning sweets. Is your mouth watering yet? We’d love to hear which DIY novelty donuts are your favorites in the comments section below!